after a stone has been treated surgically and it is sent for 'stone analysis' in the hospital laboratory which confirms it to be a cystine stone. Your doctor will often obtain a urine sample. The first thing they can do is to simply look at the colour of your urine which should be a very pale yellow or almost colourless. They can use a 'dipstick' (image top right) to look for blood, white cells (marker of inflammation/ infection), protein and nitrites (marker of infection). This sample is then often sent to the laboratory for analysis under a microscope and to see if any bacteria are cultured (grow). Another useful test from the urine dipstick is the pH (acidity) of the urine. We know that cystine is more likely to form stones in more acidic urine and therefore less likely to do so in alkaline urine. Thus a treatment for cystinuria is to alkalinise the urine. By measuring the pH of the urine over time, your doctor will be able to judge whether alkalinisation treatment might be helpful and which times of day may be most effective. Note: as the urine becomes more alkaline, other stone types may form and so it is important to measure the pH before and during treatment. If someone is being investigated for recurrent stone formation then the urologist will often send either a single sample of urine for a 'spot cystine' test or a '24 hr collection' when all urine from a whole day is analysed. If you have cystinuria, this will confirm the diagnosis. The level of function of your kidneys should be checked at least yearly. This is done by taking a simple test which measures a chemical in your blood called creatinine (anything less than 120 is normal). From this the rate at which the kidneys filter the blood the glomerular filtration rate (eGFR) is estimated. It is roughly equivalent to the percentage kidney function and anything over 60 is considered normal. The eGFR will fall as a natural part of aging and many people in there 80s with have perfectly normal healthy kidneys and a low GFR. X-ray KUB - 'KUB' simply means Kidney-Urine-Bladder. This type of x-ray this is the simplest way of seeing/ monitoring kidney stones. 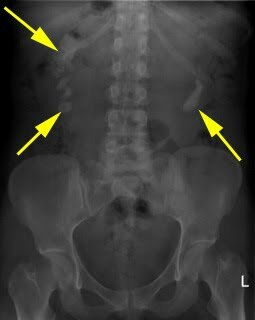 Unfortunately cystine stones are often difficult to see on x-ray, especially when they are small, so this limits the usefulness of plain x-ray. The image (to the right) shows large cystine stones (marked with yellow arrows). Intravenous Urogram - IVU - This is a series of x-rays to show the anatomy of the kidneys and ureters to show any stones or obstruction. It is usually done in the emergency department if you have stone pain (most departments now do CT scans instead). After an inital x-ray an injection of contrast (dye) is given into the veins. This dye is passed out by the kidneys. Often another x-ray is taken 20 minutes after the injection. An example is shown on the 'Symptoms of stones' page. Your doctor will check any allergies (e.g. to the contrast, shellfish, iodine or asthma) with you beforehand to ensure it is safe. It is common to feel a warm sensation after injection and it can also give you a metallic taste in your mouth. Sometimes it is necessary to take x-rays several hours afterwards to watch the dye come out of the kidney. Ultrasound – this is a useful way of monitoring most cystine stones and can be used in the clinic by the urologist or radiologist. It may not always be useful in an acute stone episode as it cannot image the ureter (tube draining the kidney) which is usually where a stone becomes stuck during an episode of renal colic (acute pain in the back). An example of a stone seen on ultrasound is shown below. CT – is an excellent way of detecting cystine stones but is limited by the increased radiation exposure required when compared with a standard X-ray and ultrasound which uses none. However, modern day CT scanners allow radiologists and urologists to work together to try to limit the doses needed to evaluate for stones when they are used. An example of a kidney containing 2 cystine stones seen on CT scanning is shown to the right. MRI – Is not widely available in most hospitals and is worse at diagnosing a stone than CT but is useful in patients who need to avoid radiation i.e. pregnant women. On MRI scan (see below), stones appear black (unlike with x-ray, ultrasound and CT) - the white areas around the stones is urine.